UCF students' augmented reality app wins first place at Health Game Jam. Ask young kids what it’s like to get a shot or go to the doctor, and you’re likely to get some frowns. Two students in the interactive entertainment master’s program at UCF, Christine Wright and James Gaiser, wanted to change that. Their invention, “Boo Boo Snap” is a prototype for an app on your smartphone that projects 3-D images, talking characters and medical advice onto regular bandages. 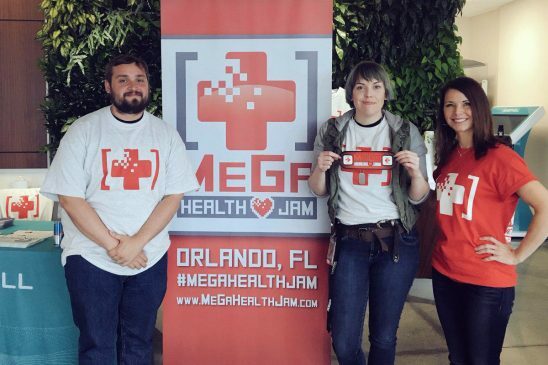 Their idea was developed April 13-14 at the inaugural MeGa Health Jam, where it was awarded “First Place” by a panel of medical experts and game developers. The app was chosen from 17 projects created at the local event, which gave professional and amateur game developers 48 hours to prototype a game, technology or app to be used in healthcare. As part of their winnings, the team won free booth space at future local tech events, legal and medical consulting services and access to office space.